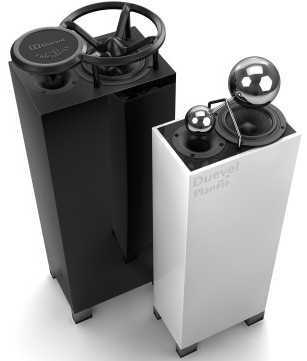 Less than a year ago I reviewed the Duevel entry-level floorstanders, the Planets, a small omnidirectional loudspeaker priced below 1000€/pair. For details on the Company, the designers and their philosophy please refer to that article. The Enterprises I've just received (this is a World premiere) are the next step up in the Duevel catalogue and promise to perform like the Planets, just slightly better. We'll see! These Enterprise's are quite similar to the smaller Planets, the main differences being the slightly larger cabinet (83 x 30 x 20 cm), a different omnidirectional diffusion system and a bigger woofer. Obviously, even the price is different, a pair of Enterprises costs more than twice the price of the Planets. Instead of the two chromed spheres we saw on top of the Planets, we now have a strange frame that resembles the Enterprise starship of the famous Star Trek saga. The 17 cm woofer (15 cm on the Planets) has a paper membrane (instead of kevlar), a rubber surround and a big (10 cm) ferrite magnet, while the basket is die-cast aluminum. This is the model SB17NRXC35-4 by SB Acoustics, in a 4-Ohms version. The tweeter is the same unit used in the Planets, specifically the P-Audio PHT 407 1" horn driver (for a pic browse the Planets review). The woofer is loaded into a bass reflex enclosure, with a bottom (base) firing port. In order to keep this reflex port reasonably far from the floor the cabinet makes use of 4 chromed feet. Again, the binding posts (monowiring only) are located at the bottom of the cabinet, close to the reflex port. The crossover network is glued right behind the binding posts plate and is claimed to use a linear phase scheme. I assume the crossover frequency to be similar to that used in the Planets (4 kHz), as the tweeter is the same and the woofer frequency response extends nicely up to 5 kHz. Crossover passive components are still from Intertechnik. The sensitivity is low (87 dB/w/m) but higher than that of the Planets (85 dB!). The frequency response is not declared but, by ear, it extends several Hertz's below the Planets response which was measured at 30 Hz (@ -3dB!). Nominal impedance is 4 Ohm. The cabinet is made out of reasonably thick MDF panels, with several internal reinforcements and damping sheets. Internal cabling is the usual figure-8 2 mm2 red/black cable, directly soldered to the woofer terminals and connected via fast-on's to the tweeter terminals. The cabinet has a very good finish, available both in black, white and this Ferrari Red I've been sent. Honestly, it seems a kind of bordeaux instead. As in the Planets, no dust cover is supplied. The owner's manual contains valuable infos on speakers installation and correct set-up. SB Acoustics 17 cm midwoofer, with paper membrane and ferrite magnet Duevel Enterprise - bottom view. Monowiring, thanks! Being familiar with the amazing three-dimensional and spacious sound of the smaller Planets I expected these Enterprises to perform in a very similar way. Indeed, the family sound is still there but the larger cabinet and woofer add more weight and oomph to the performance. Imagine a Planets with much more bass, both in terms of sheer impact and extension. They perform with greater authority and even the lowest bass notes now sound more impressive. Considering the bass frequency response of the Planets was already impressive (30 Hz @ -6dB!) the Enterprise first octave has a presence and definition even more commanding than in the smaller model. The subterranean intro bass notes in Angel (Massive Attack's "Mezzanine") have more weight and better articulation. The new woofer isn't just bigger but it is also completely different from the unit in the Planets. For example, the cone is a paper composite instead of kevlar. 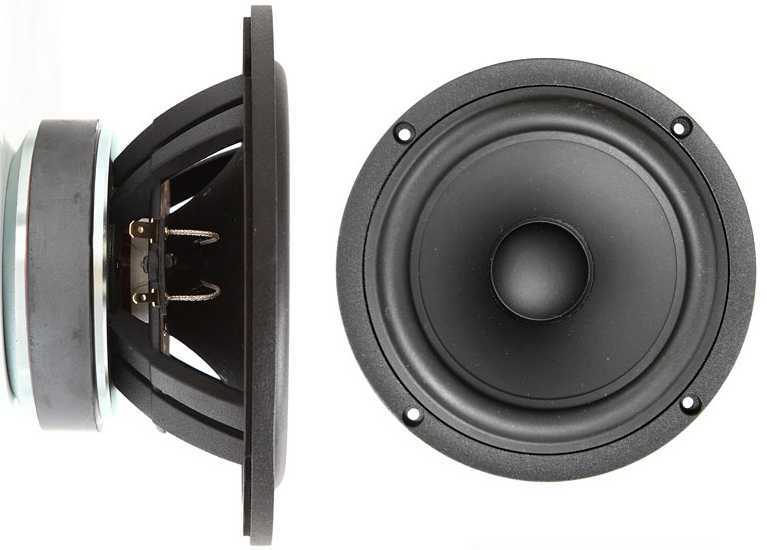 Considering the midwoofer covers a large part of the mid range spectrum, this fact heavily influences speaker performance in the mid bass, which appears beefier and sometimes rising above the rest of the spectrum. Even the mid range has a different color: voices are reproduced in a more natural way (paper sounds more natural than kevlar?) and choirs appear better defined. Perhaps this results from the fact the midwoofer works in a less stressful situation. The smaller driver in the Planets, being forced to reproduce really deep bass notes, sometimes was too close to its physical limits. As with the Planets, these bigger Enterprises lack the aggressiveness in the mid range that might be useful in certain situations. Perhaps this is a by-product of the unusual drivers installation and the effects of omnidirectional diffusion. 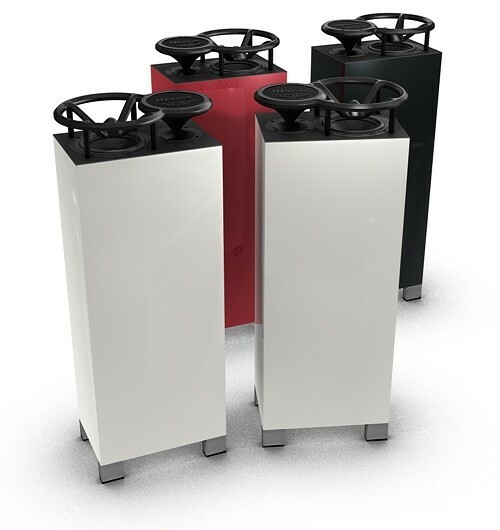 Actually we have a completely different woofer, a new crossover, a larger cabinet and even a different 360° diffusion system...but the character of the mid range remains virtually unchanged! Certainly this also depends on the interaction of the omnidirectional sound with the shape and the timbre of my listening room (quite absorbent, indeed). More lively rooms might react differently. The omnidirectional magic formula works excellently even if the diffusion system is different. The sound does not appear coming from the loudspeakers but from the space that surrounds them, as it happened with the Planets. This means the listener isn't forced to search for that perfect sweet spot: two (or three!) listeners might enjoy the sound of these speakers, even if they are not seated exactly at the center. Small variations from the ideal position don't produce a dramatic change in the perceived tonal balance. Even height variations are not a real problem with the Enterprises. While this is definitely a no-no with traditional loudspeakers, since the listener should always keep his ears at the same height of the tweeters (frustrating, isn't it?). However I do not mean to suggest that the sound reproduced by these speakers is a blurred cloud which oscillates in the listening room! Everything takes place right in front of the listener, exactly like it happens with traditional speakers. More on this in the subsequent 3D soundstage paragraph. Generally, these speakers offer a rather euphonic (even laid-back) sound: the performance, despite what one might expect from a horn tweeter, is never fatiguing nor harsh. This doesn't necessarily translate into anything inoffensive! When required, they can sound metallic and stingy, for example with horns or violins (e.g. in Vivaldi's "The four seasons" performed by Nicholas Chumachenco on Edelweiss label). Do not think they can forgive everything, as they won't turn a bad recording into something sweet and hence acceptable. For example, the latest Coldplay albums sound horrible, because of their excessive dynamic compression and limited bandwidth. The speakers are able to extract a large quantity of details from any recording. Like the Planets, these are speakers meant to play for hours and hours and, this time, even at very high listening levels. One of the (logical) limits of the Planets, as identified in their review, was power handling. The small woofer, which performed unbelievably well in terms of bass extension, showed shortcomings in the macro dynamics department. Records rich in bass frequencies played at high listening level could be a problem indeed. The new, bigger woofer is definitely a different beast. To reach its physical limits one has to play killer tracks at insanely high listening levels. As a result, dynamic performance is vastly improved. The bass range remains punchy, articulated and extended even under heavy load. The noise produced by the air in the bass reflex port warns you when it is wise not to ask for more. Like in the Planets, the woofers' dance is noticeable but I haven't heard that horrible clack-clack sound of the driver reaching the end of its travel. Transient response is good but that certain laid-back attitude in the mid range tends to slow things down a little bit. PRaT score is good, though not excellent. These speakers can fill even large listening rooms with a full, solid and powerful sound. When required, they can even sound aggressive: for example, with certain musical genres (hard rock etc.) the distance between the Planets and the Enterprises is noticeable. Even the Rage against the machine albums seem to recover some of their primordial wild force. Of course, these are not speakers meant to blast the listener, so heavy rock and similar genres aren't exactly their regular cup of tea. In other words, if you're looking for a <>Klipsch-like performance, you should look elsewhere. I've already extensively described the soundstage these speakers can create in the Planets review, so let me focus on the differences between these two speakers. Though the tweeter is the same, the crossover and the woofer are different and so is the 360° diffusion system. For this reason the 3D performance is slightly different, in fact I'd say it is significantly better. The 3D image appears to be larger and more stable, with a better focus on instruments and singers. The other parameters (depth and height of the stage) are mostly the same as before. Again, you shouldn't expect the sculpted 3D image certain high-end loudspeakers can create, provided you stay glued into that sweet-spot. The Enterprises prefer to give you the idea of a real, natural event, like when you listen to an orchestra in a large concert hall. In that situation it is impossible to precisely locate instruments or voices. Correct proportions are preserved, and so are horizontal and vertical planes but forget the pin-point imaging of certain high-class minimonitors! Once again, the keyword seems to be natural, in opposition to artificial. There's nothing that sounds artificial with these speakers, if you're looking for special effects to impress your friends, look elsewhere. Magical is their ability to disappear! 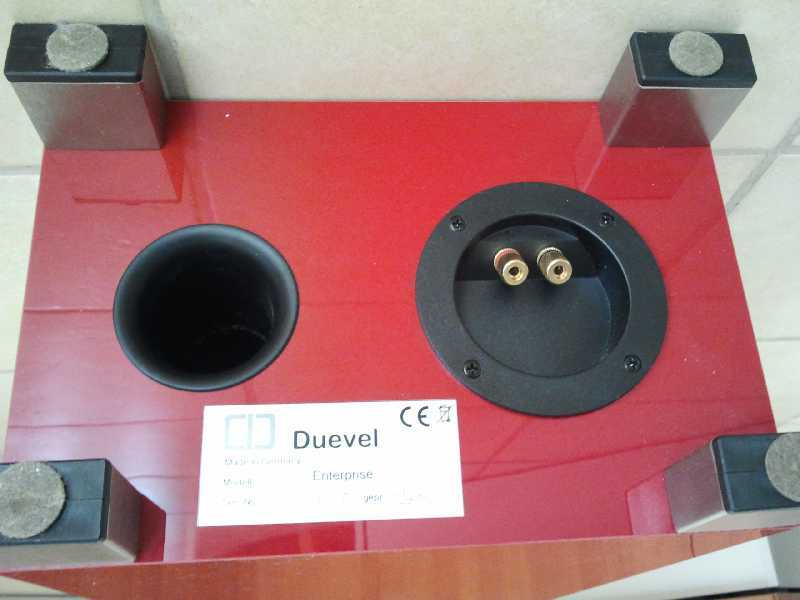 Moreover, the Ferrari Red cabinet doesn't match well with the black stove. A far better match would be a black cabinet. Of course, this is just a matter of taste. Other, minor complaints can be found on the Planets review, since many things are very similar. Sound. The sound is quite different from that of a traditional loudspeaker. You may fall in love with it after the first minutes or hate it forever. Once you're used to these kind of natural performance it is hard to go back. Anyway, perhaps these speakers aren't for everyone, for this reason I strongly suggest an in-home audition before purchase. The tonal balance and the general character of the speaker favor acoustic music, orchestras, jazz and light pop. With heavy rock they perform much better than the Planets but headbangers might still find them too relaxed. These speakers are extremely easy to set up, the omnidirectional pattern makes them less sensitive to nearby wall reflections. Of course, if the rear wall is too close to the speakers the mid-bass and the bass range get a boost that, in my opinion, isn't necessary (nor welcomed). The owner's manual recommends keeping speakers and listening seat at the same distance (equilateral listening triangle, that is). Tweeters should be as far from each other as possible. In any case, feel free to experiment with different arrangements. The amplifier should be ready to drive a low impedance load (4 Ohm nominal) and deliver reasonably high power into that, since sensitivity is just 87 dB/w/m. The Planets required even more powerful amplifiers, while in this case I'd recommend staying above 20-25 watts per channel at least. The bigger woofer handles high power with ease. Don't forget to break in the speakers a little bit, as this really opens up the sound. What, then, are the differences between the Enterprises and the Planets? A slightly bigger woofer, a larger cabinet, a more crowded crossover network, a different 360° diffusion system. Let's investigate these difference in detail. 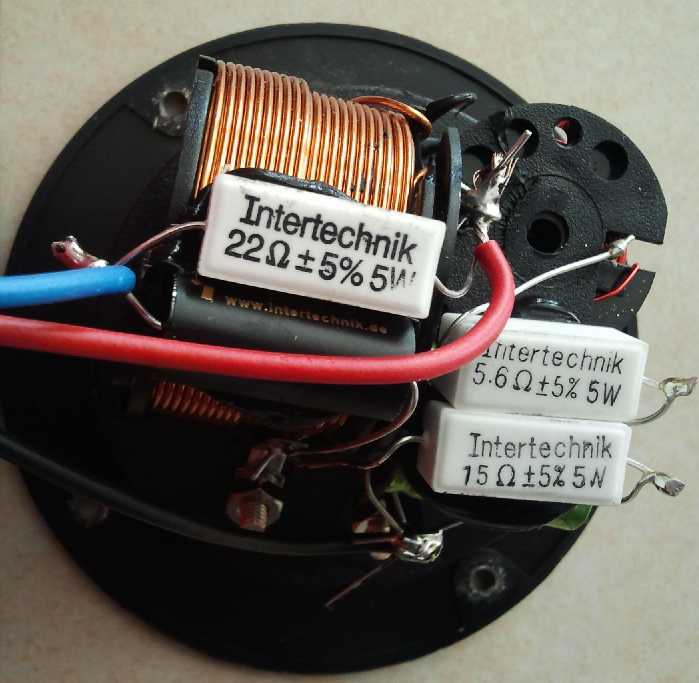 The woofers cost 120 €/pair and this is the regular DIYer price, on the Intertechik website. Even assuming the Planets woofers are less expensive...let's say 60 €/pair? We're still talking of a mere 60 € difference. The crossover uses the same components (Intertechnik) but there's more of them...let's say another 20-30€ extra. The cabinet is larger (30x20 instead of 26x15, the height being almost the same) and I'll let the reader evaluate how much this might influence the final cost. The diffusion system is made of plastic, though the Planets one seemed metal. I don't think there's a major cost difference here. On the other hand, I understand that the two models MUST belong to two different price ranges, otherwise it would be hard to justify the existence of both, in the same catalogue. The final result of this obvious market placement is that the Planets have a very good price/quality ratio, while the Enterprises, even considering they sound globally better, should be less expensive to match the same Q/P ratio. Summarizing, I consider these Duevel Enterprises as Planets on stereoids, sorry, steroids :-) A beefier sound, better power handling and macro dynamics, a more natural mid range and a better 3D image. Unfortunately the quality/price ratio isn't the same so it's up to you to evaluate and decide if their asking price is worth the steep 1250 € difference. These are speakers for pure and simple music lovers, who prefer to spend hours and hours listening to records (and not to loudspeakers!). Easy to fall in love with them, especially if you prefer Music over HiFi. No problem for us to explain the higher price of the Enterprise! The tweeter in the Enterprise is not the same like the one we install in Planets, it has a titanium diaphragm, a larger magnet and it costs twice as much and the sound is much better (model PHT-406T). 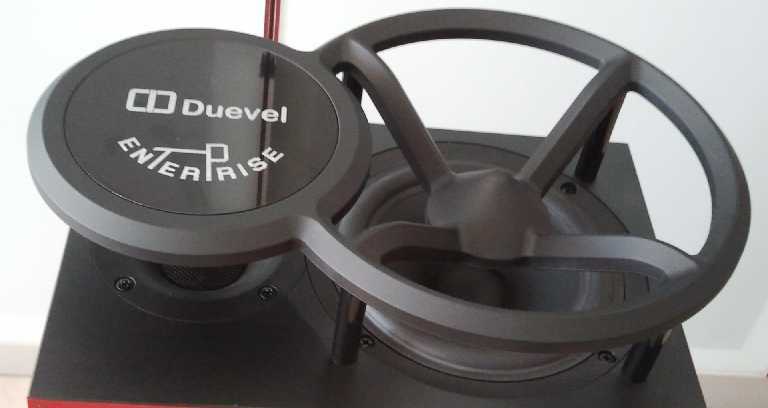 Additionally we build up a horn construction for this tweeter to guarantee the best sound of the higher frequencies in this omnidirectional way. The Enterprise had a special made horn, of course of glass fiber reinforced Polymer and everybody knows how expensive it is to produce such an injection molded part and the necessary tools. "...the woofer frequency response extends nicely up to 5 kHz." , it does not work, far off (about one octave lower). When I took the pics of the Enterprise I had a look at the fine print on the tweeter and, perhaps I got it wrong, but I recall it read PHT 407. Unfortunately I didn't take a picture because I had those of the Planets ready to use. Anyway, no big deal, perhaps my fault. By the way, I've found the PHT406 tweeter and, just for the record, it has a phenolic resin diaphragm, not titanium. The PHT 407 costs 24€/each. I've found a PHT406 for 47$ (35€) at US Speakers. Thanks for the additional information on the construction of the omnidirectional diffusor. As for the woofer frequency response, perhaps I haven't been clear enough. Let's try again. When I write that its response extends up to 5 kHz I refer to the (free) driver without crossover network. This datum is from the official frequency response graph on the speaker manufacturer's website. For readers' convenience I publish it below. As it can be seen, the woofer response extends nicely even above 5kHz (blue line, on-axis response, of course). I assume your crossover network cuts its response an octave below 5kHz (? ).